Gave Moopler Launcher an update: Updated to work with the latest version of MapleStory Global (v203) Cleaned up the UI a little Encryption of the stored accounts is not available in this version. Will add this at a later point when I've cleaned house in my local repository. When encryption is added I will publish the source code on GitHub. In the meantime, feel free to inspect the .NET assembly with ILSpy or something. How to use (First use) Extract archive and place folder anywhere you like (I would suggest your Program Files (x86) directory) Open Moopler Launcher.exe Press the 'Cogs' icon to configure the MapleStory.exe path and save the settings Add one or more accounts to the database Press the save icon to save the database (%appdata%\Moopler\Moopler Launcher) How to use Open Moopler Launcher.exe Press the folder icon Select the account you want to launch MapleStory for Press the start button N.B. 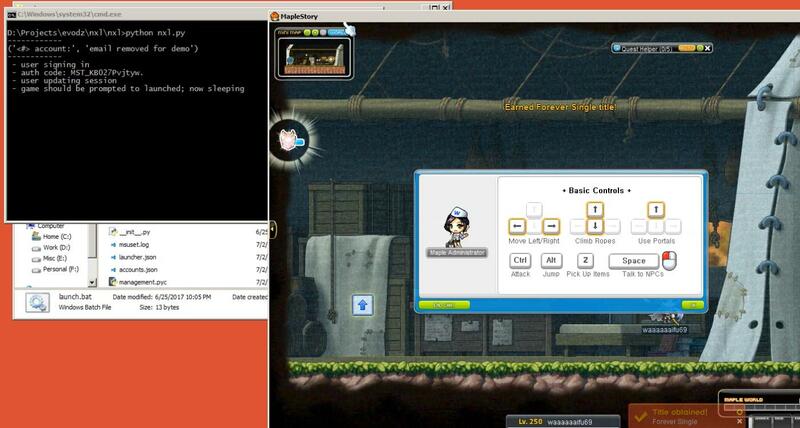 You need to have Nexon Launcher running, else MapleStory will throw an error. It does not matter which account is logged in on the launcher, if at all. Disclaimer Use this tool on your own risk. I am not responsible for any accounts getting banned.